Big Finish again revisits Doctor Who’s past to kick off its 2015 Main Range entries, sending the Fifth Doctor and his companions back to E-space and the planet of Alzarius with its very unique evolutionary cycle. As Mistfall and the Marshmen approach with no protection available in the open or aboard the newly-arrived Starliner captained by Decider Merrion, the world of ‘Full Circle’ comes to life once more with just enough new ideas to keep it fresh. Adric had mentioned before his demise that he had found a way back into E-space, and it is his coordinates and calculations that have led the TARDIS back through a CVE to his world, a nice nod to the character’s final appearance in ‘Earthshock.’ Landing on Alzarius once again, the Doctor, Nyssa, Tegan, and Turlough soon come across visitors of New Alzarius, the descendants of the original Alazarian settlers who left upon the Starliner many generations ago. 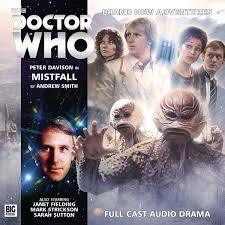 Although ‘Mistfall’ does utilize many of the same plot points as its predecessor, they are brought into much greater scrutiny here, allowing a decent exploration of the morality and consequences regarding assumptions about and experimentation on the Marshmen. At the same time, the story dares to expand upon the core idea of ‘Full Circle,’ discussing another unknown evolutionary step between the two dramatic forms and the differences in opinion that that truth generates. The morality regarding the events on Alzarius is the driving force of ‘Mistfall, and fortunately Peter Davison does well in indignantly proclaiming outrage as Jemma Redgrave’s Decider balances what is best for her people again what is best for the planet. This is very much a direct continuation of ‘Full Circle’ in every regard, though, and it may be difficult for those not familiar with that original tale to fully grasp the complexities in play since ‘Mistfall’ does make some assumptions with foreknowledge. However, the general concepts are laid out well and make ‘Mistfall’ an enjoyable tale in its own right even without dedicating more time to summarizing previous adventures. With Nyssa and Turlough taking part in a distinct adventure that dovetails nicely with that of the Doctor and Tegan, the story of ‘Mistfall’ as well as its score also manage to capture the essence of 1980s Doctor Who well, adding to the overwhelming sense of nostalgia very effectively. It’s fair to wonder how frequently Big Finish should delve in Doctor Who’s past when there are an infinite number of completely new stories to be uncovered and told. Nostalgia has always been the driving force of the audio medium, but revisiting the television roots is seemingly becoming increasingly common. Fortunately, even though Alzarius was not necessarily among the most memorable worlds on television, writer Andrew Smith has been able to recapture the essence of his original script while also offering some new concepts and discussions. ‘Mistfall’ may not shake the foundation of Doctor Who in any meaningful way or do anything completely novel, but it does offer a familiar entry point for this new excursion to E-space and the very unique threats that it can post.